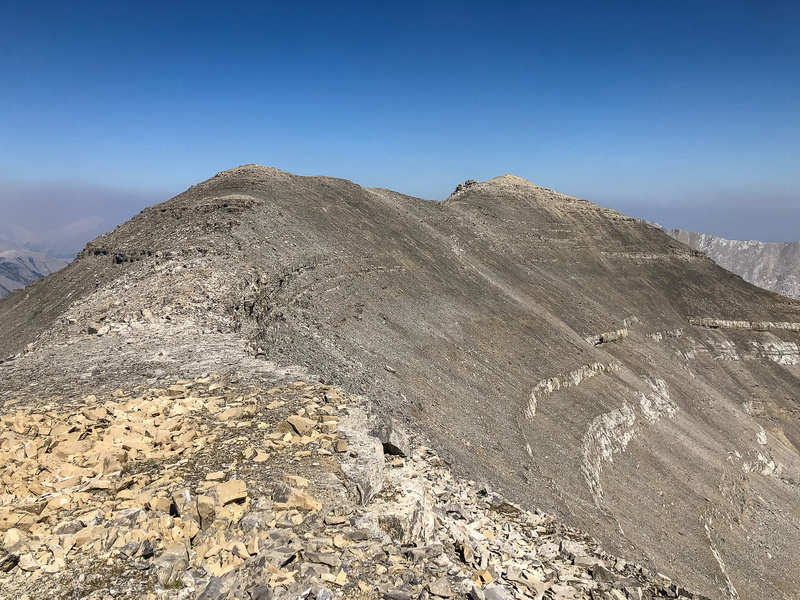 Difficulty Notes: There are easier routes up Junction Mountain but the ridge traverse from Pyriform isn’t one of them. 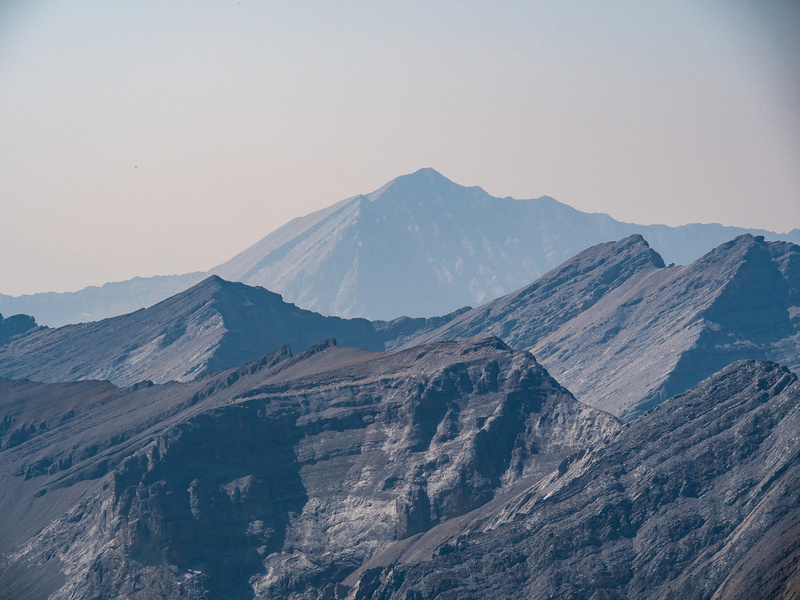 Exposure, loose terrain and routefinding combine to make this a difficult scramble. 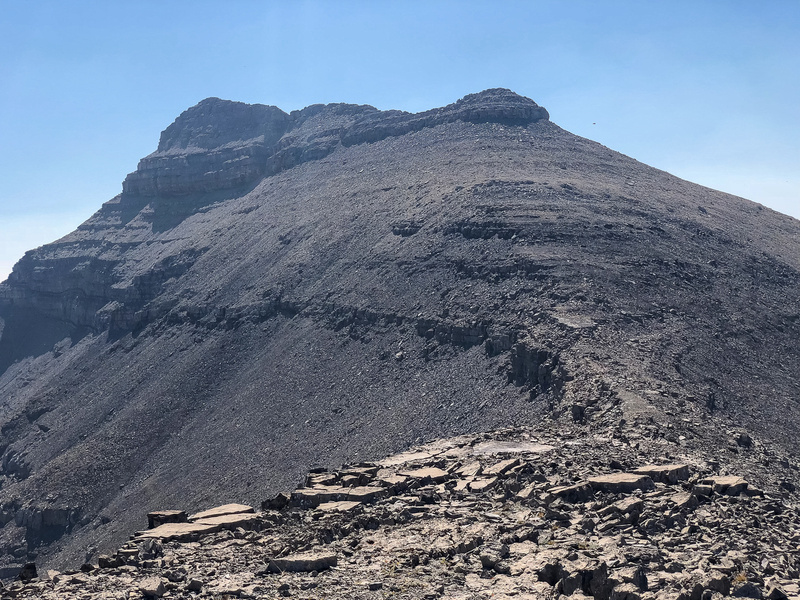 After the easy (hot and lengthy) scramble to the summit of Pyriform Mountain and its fly-covered summit cairn, Wietse and I turned our collective attention to the alluring ridge joining it to Junction Mountain. The first part of the traverse was, as expected, fast and pleasurable. 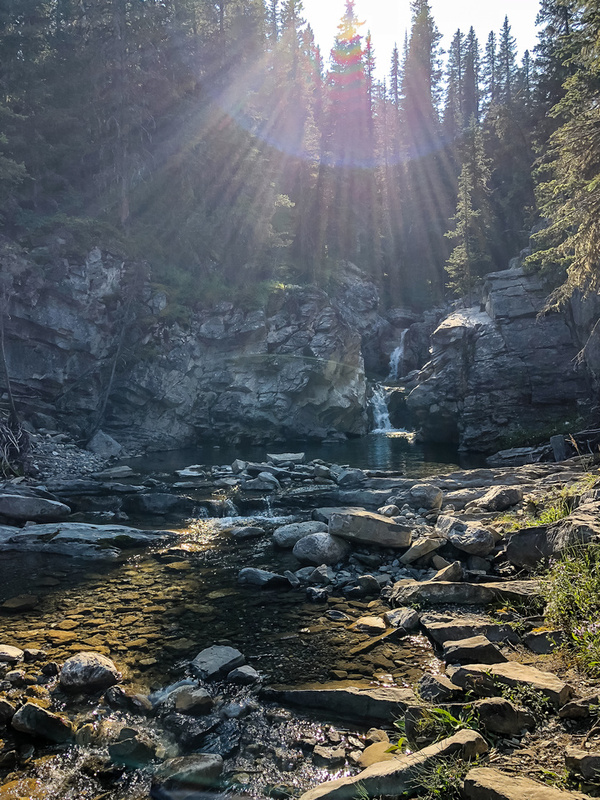 This was a good thing, because we were running low on water and were feeling the effects of an incredibly hot and windless summer day up high. Our views also helped, as they were much better than expected, especially the view we wanted which was the east faces of the Lineham Peaks – not clearly visible from anywhere else. I was feeling “on point” for this traverse for some reason. 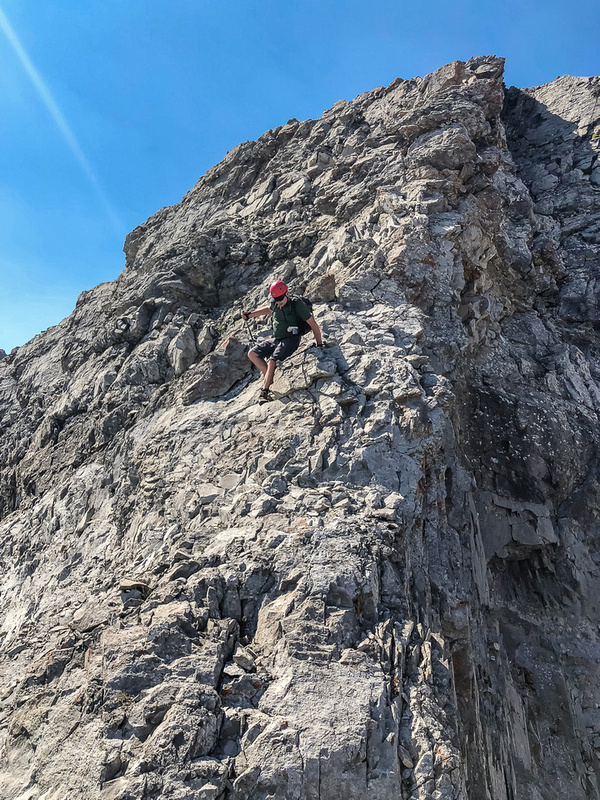 I was fully confident of finding a route through or around any difficulties and led quickly over the first sections of ridge. Ungulate paths led me down and around a few key steeper sections but we knew that the real crux was still to come. Several times along the ridge I thought we might be turning around, but every time I’d sneak a peak down the east face and find ledges and breaks through low cliffs to escape the difficulties. Usually these breaks had sheep tracks on them to validate our route choices. 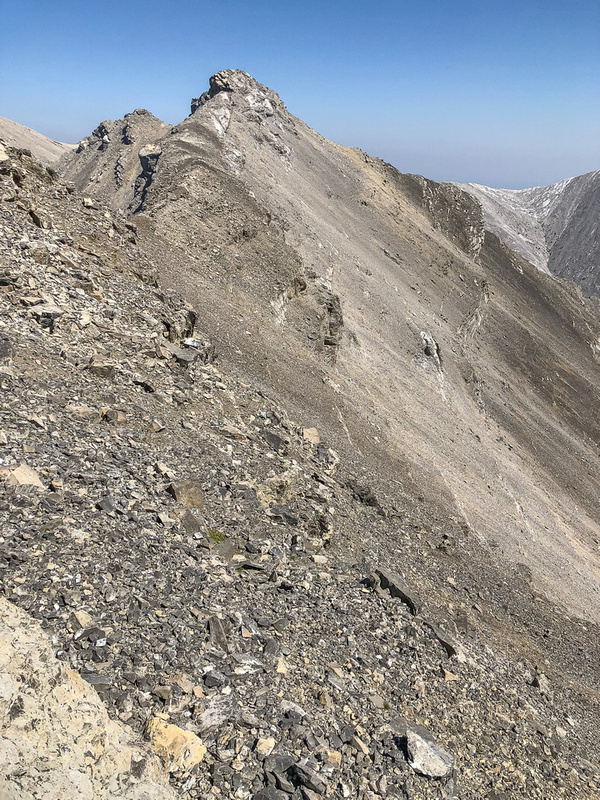 Just over an hour into the traverse we started coming across more difficulties and the route became quite interesting as we approached an ominous looking high point and crux looming far over the Junction Mountain col below. Looking back towards Pyriform Mountain with Trap Creek at left. At this point I was feeling a bit nauseous from the heat, lack of water and struggling with trying to eat something despite really not feeling like it. 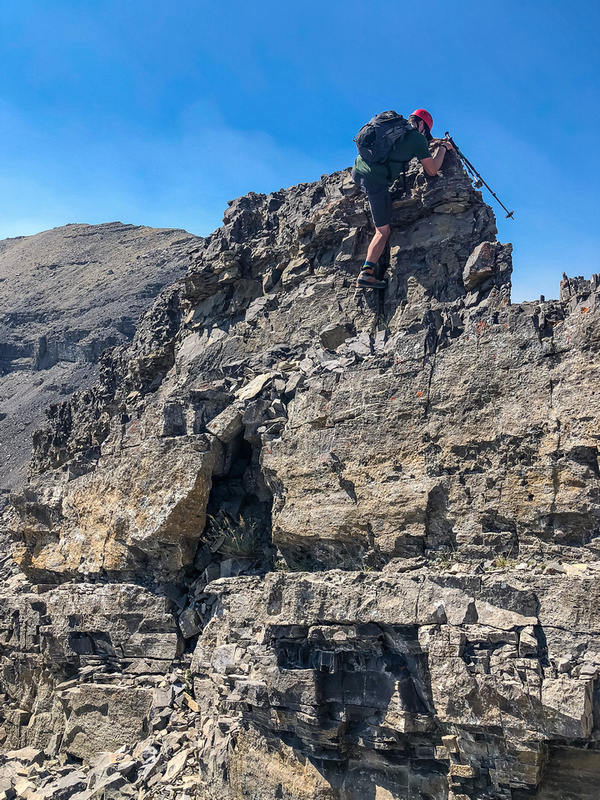 The scrambling was engaging and fun so I pushed through the mental hurdles and kept going – Wietse following closely behind but also starting to really feel the long day. 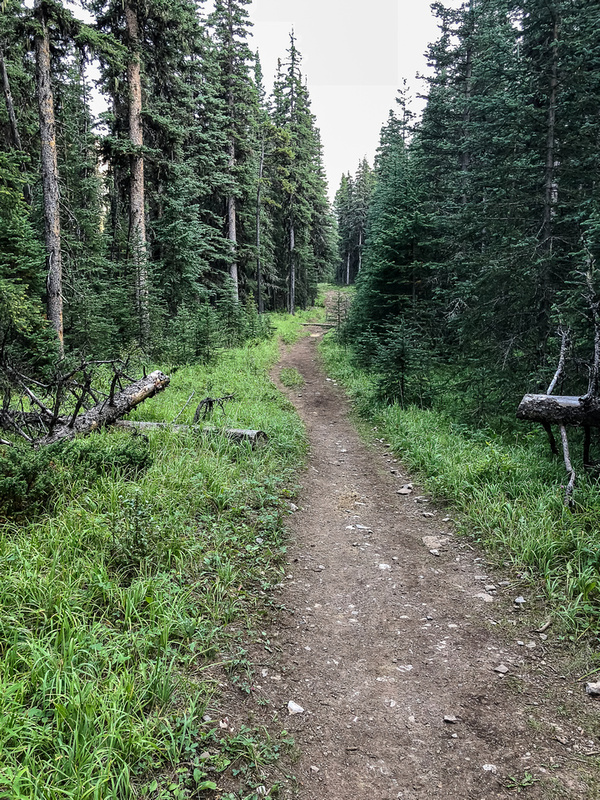 I had noticed an obvious sheep track leading off the ridge proper and around the eastern side of the looming crux and felt pretty strongly that we should follow this track if at all possible. 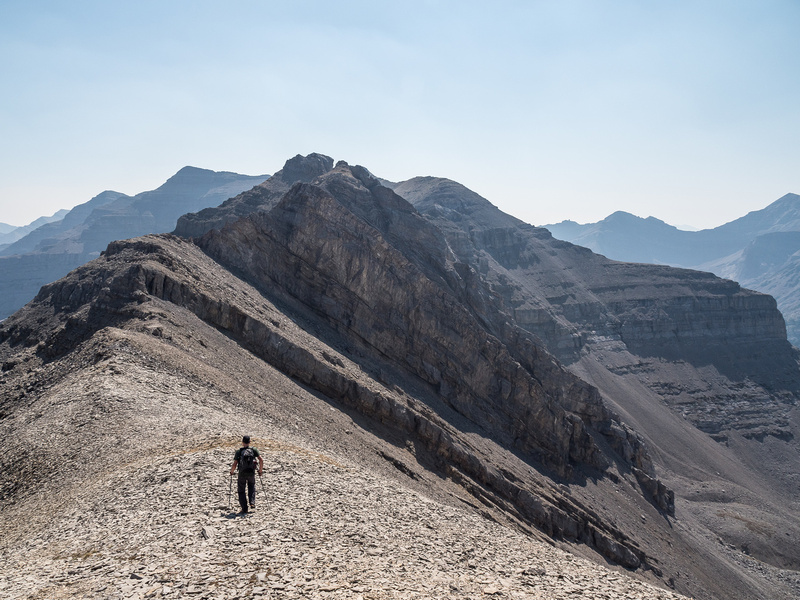 It was trickier than it looked to descend off the ridge to the track, but soon we were on it and skirting the obvious difficult terrain on its eastern aspect. But our difficulties were just beginning – again as expected. After following the track we were led back by another ungulate trail in scree to the ridge proper. From here we downclimbed a series of very loose, exposed ledges, low cliffs and sharp (LOOSE!) ridges to the Junction Mountain col. It was more involved than it first appeared, but I always managed to find a “reasonable” route. Looking back up some of the sections we came down, we were amazed that there was a scrambling route there! Jamie is 100% correct when he states that there IS a scrambling route but you’ll have to look for it. In a strange twist, I found that finding a route through the crux section via downclimbing was actually not too bad. I simply looked for ledges and cracks that we could utilize and managed to find something every time I needed to. Wietse downclimbs a tricky exposed section of the ridge. Did I mention LOOSE?! It was all very loose. There is some exposure along the very loose crux and care is needed with loose rocks and boulders too. 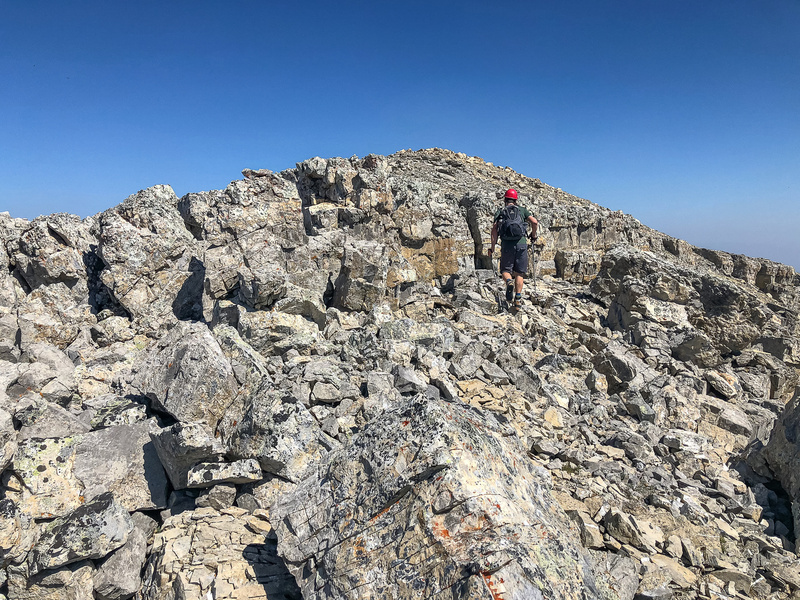 At the Junction Mountain col we knew the peak was “in the bag” – other than slogging up the 250 vertical meters to attain it! We took a break in the shadow of the crux ridge where we drained the last of our water. 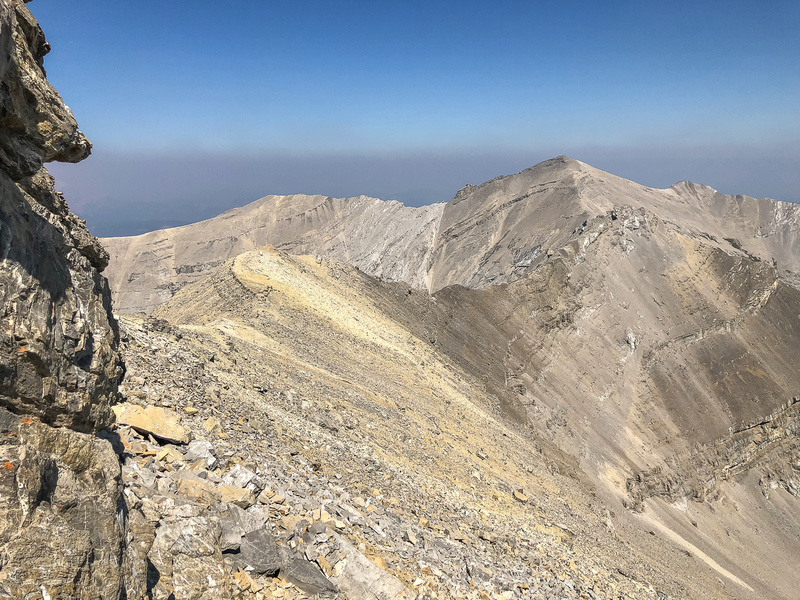 We also figured out at this point that the descent into the west alpine bowl would be easier than we expected, as we could simply descend scree slopes directly down to the valley from the col rather than go down the ascent route that Jose used. The plod to the summit was easy but HOT. The sun was relentless and I was delighted when I finally stepped up to a (fly-free!) summit cairn with a nice cool south breeze blowing across it. 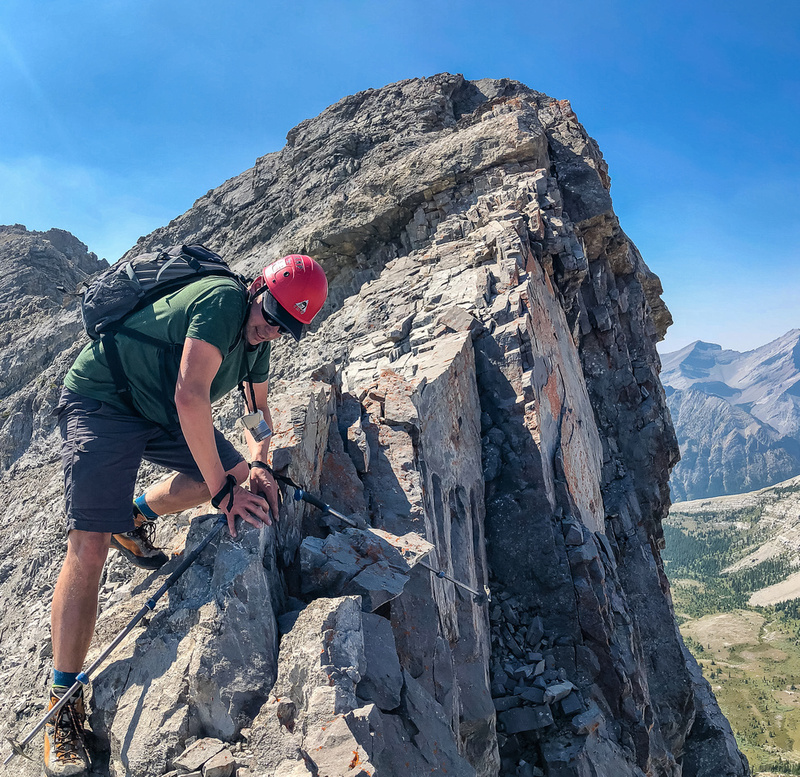 The register for such a prominent front range peak was surprisingly empty with only 1 or 2 ascents per year at most. 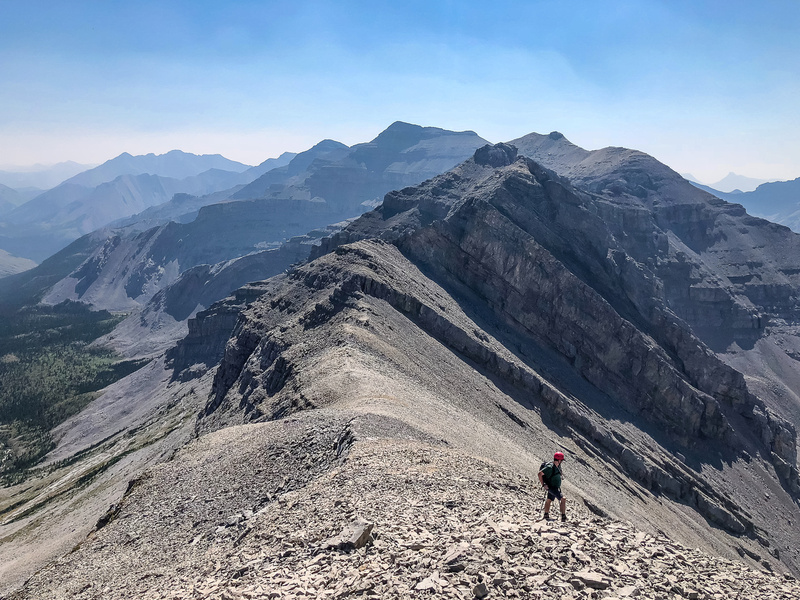 I can only imagine that Pyriform Mountain, being further and not in a guidebook must be ascended even less often, likely making these two peaks some of the least ascended official mountains in Kananaskis Country. 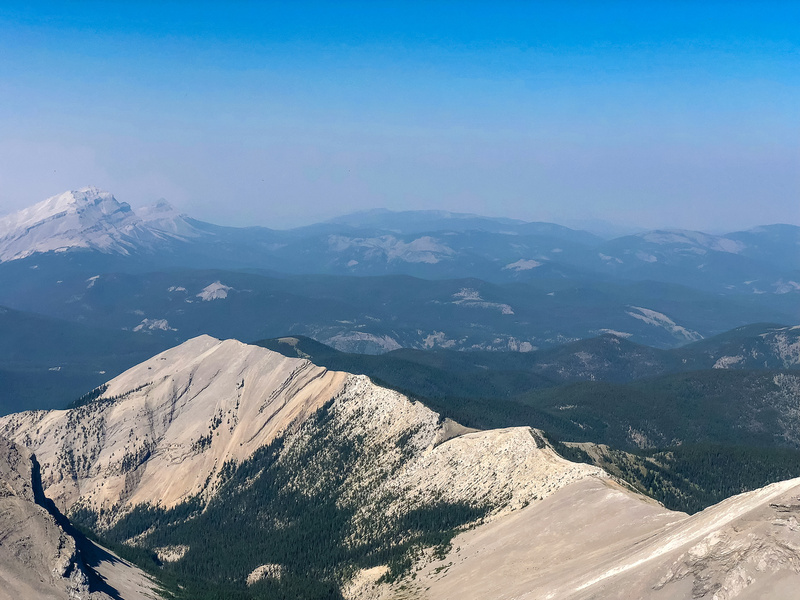 Wietse joined me at the top and we spent some time identifying distant peaks that were surprisingly visible despite some smoke and once again trying to choke down some food. Great views west and north (R) includes views of Highwood, Mist, Gibraltar, Shunga-la-she, Burns, Bluerock and Threepoint. 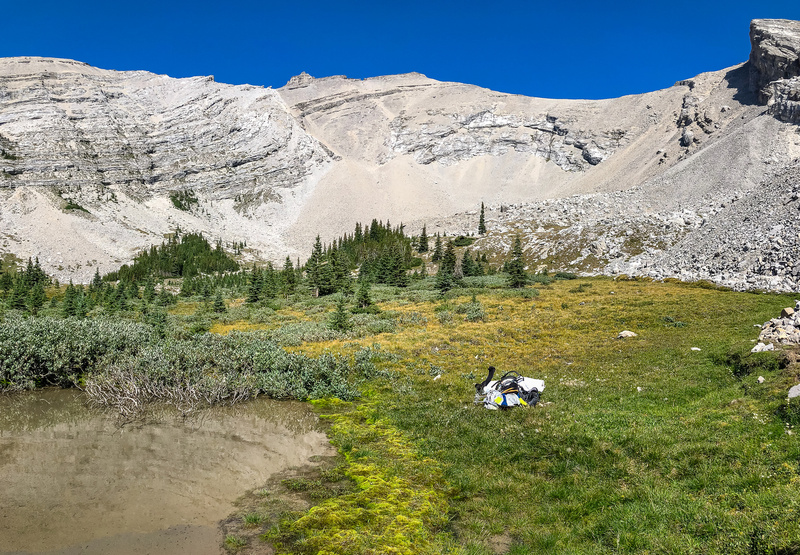 Wietse and I both needed water at this point in the day and made short work of the descent back to the col before turning west and descending scree and rock into the west bowl below Junction Mountain. 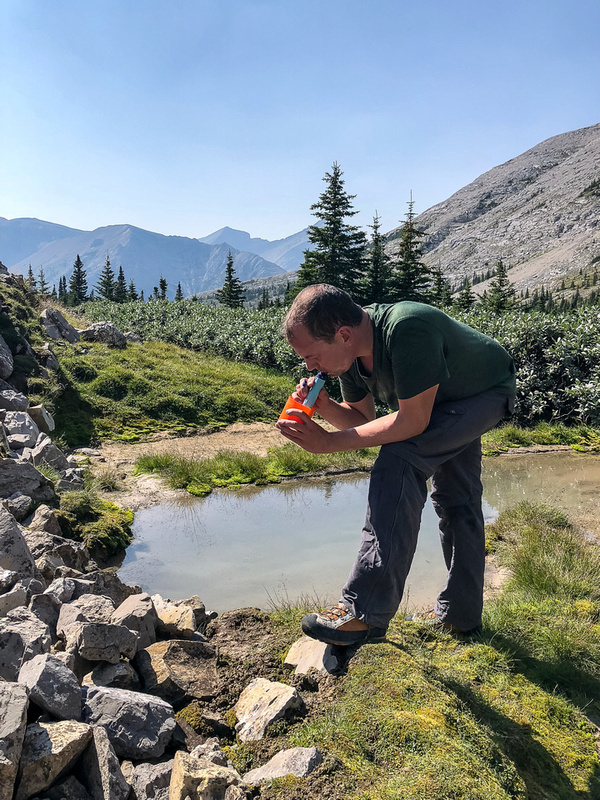 I thought I spotted a small tarn in the alpine meadows far below and imagined how tasty that water would be – using my Life Straw since it looked to be standing water. 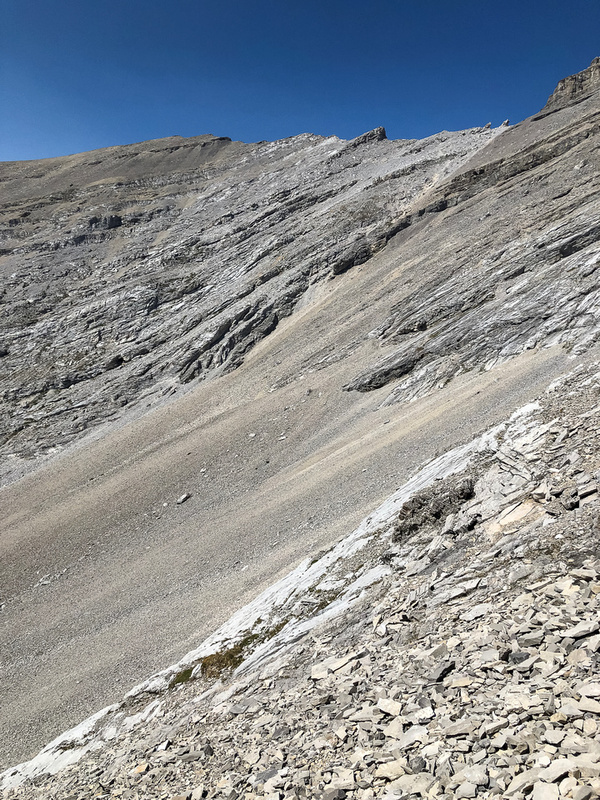 It took a while but finally Wietse could also see it and we desperately downclimbed the slope towards it – avoiding as much of the loose bouldery terrain below the west scree bowl as possible. As we walked up to the tiny pond, I could see it looked a bit nasty with many floating bugs but I didn’t care. I dipped my cup into it and started drinking through the straw. To my great surprise and delight the water was ice cold! At this point we knew it was a spring-fed water source. Nothing ever tasted so darn sweet or good and within 5 minutes I had brain freeze from the cold water. As Wietse took his turn, I dunked my head into the pond, instantly feeling both refreshed and rehydrated. That little spring-fed tarn was a HUGE bonus and made an awesome day even better! 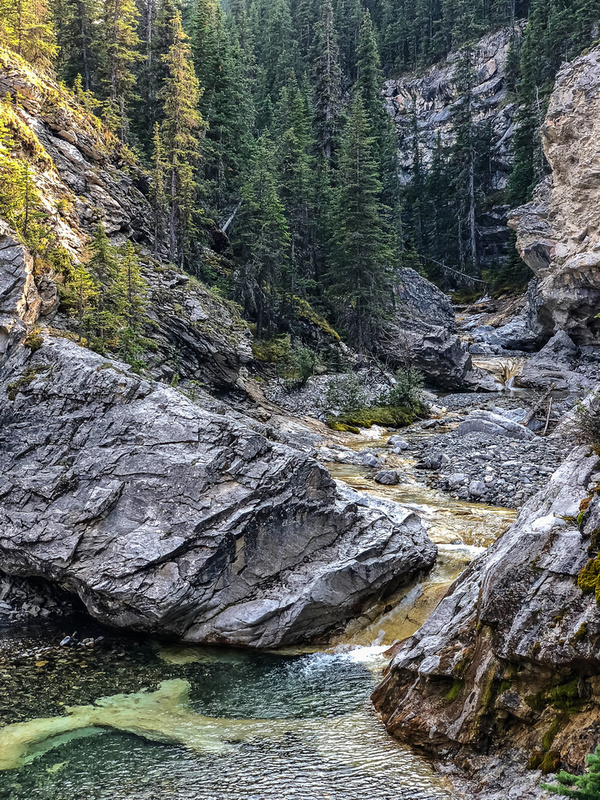 This “muddy” water hole is actually spring-fed and was so cold it gave us brain freeze. So good. 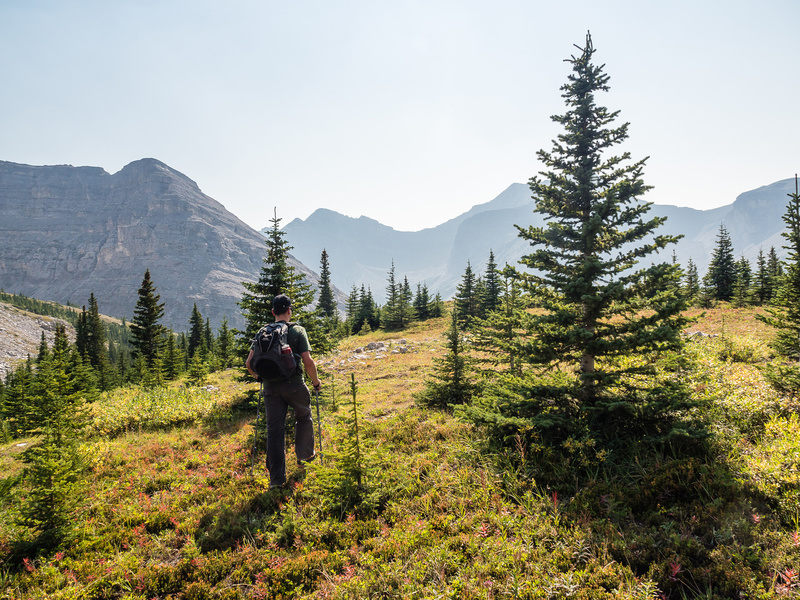 Exiting the alpine meadow was a pleasure, for the most part. 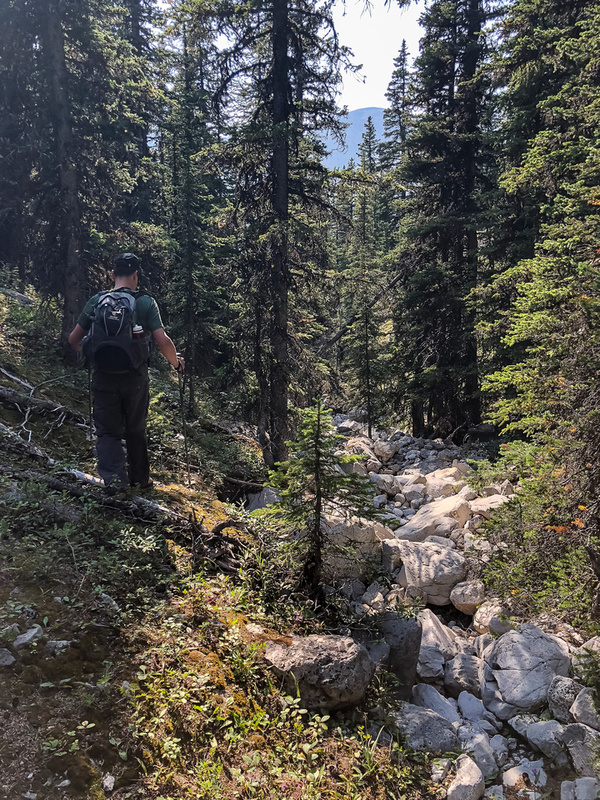 Fresh grizzly diggings kept us aware of our surroundings and soon we were bushwhacking towards our ascent track and the trail. We tried to get cute and avoid as much of the annoying return ascent section of trail but in the end we only managed to avoid about half of it and bushwhacked a bit more than necessary. After hitting the trail we were getting desperately thirsty and hot again and continued marching along it towards the deep pool and 2nd camp site. At the deep pool and small falls crossing we took our time and cooled our hot and aching feet in the creek. We drank copious amounts of water here too, and I dunked my head into the cold, refreshing goodness more than once until I had goosebumps. It was really tough to don socks and shoes again and continue along the trail, but we had kilometers to go at this point and had to keep moving or risk our muscles tightening up too much. To my surprise, the rest of the 8km exit went really well. We both felt much better after the short break in the creek and eventually we even started chatting again. 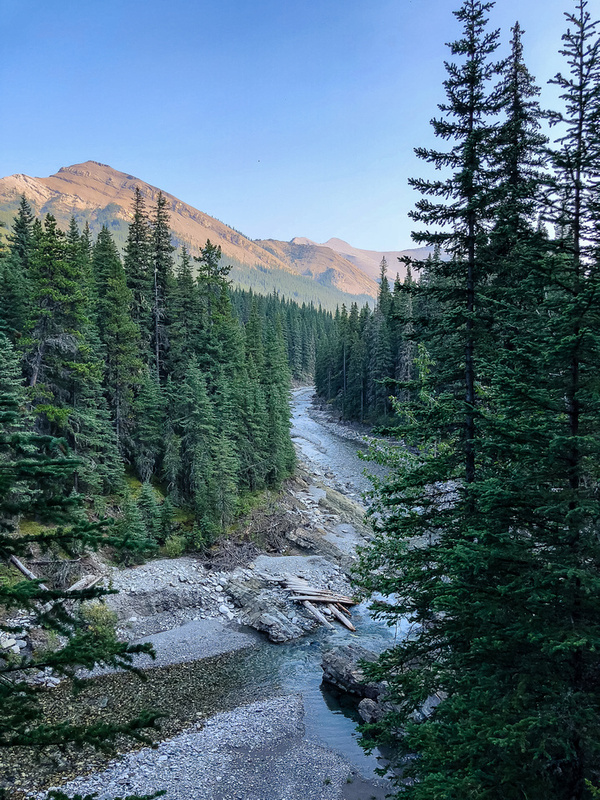 The last 5km went by much quicker than expected and the final crossing of the Sheep River felt heavenly – I didn’t even use my hip waders for it. 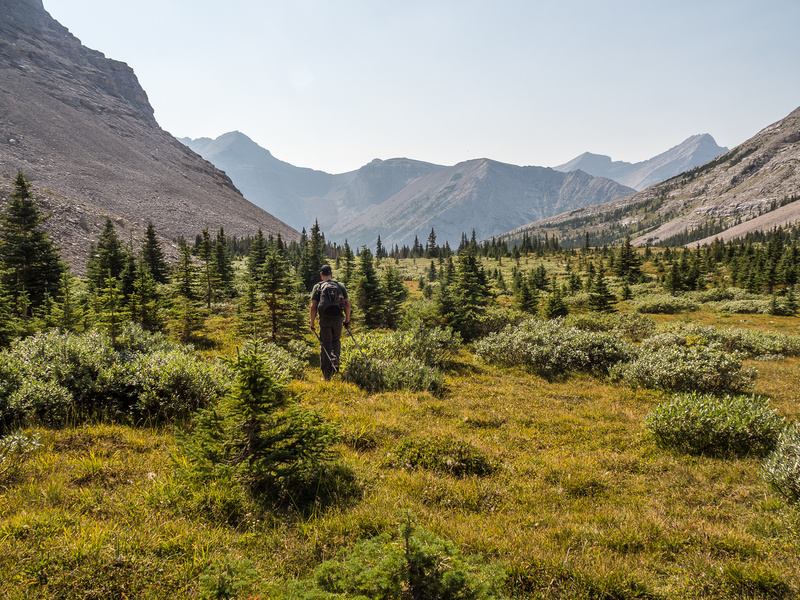 I was feeling the long day as we walked back up to the parking lot from the Sheep River but considering we’d gone almost 30km and over 1700 vertical meters in 11.5 hours that shouldn’t be a huge surprise I suppose. Looking back at the ridge coming down from Pyriform Mountain. Looking north up the ridge - obviously this is a nice easy section. Note the smoke hanging in the air beyond. 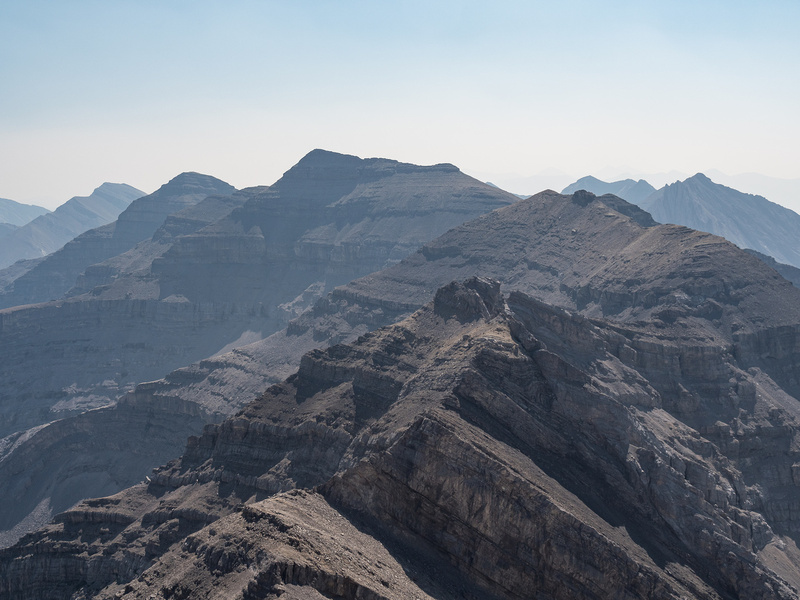 Looking back at Pyriform Mountain from the ridge. Everything went much quicker than expected. 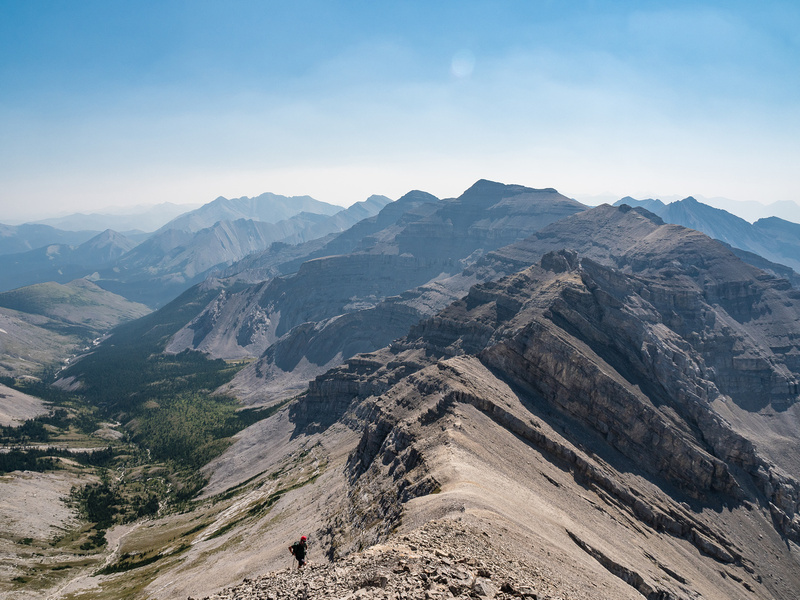 Gorgeous views over the west alpine bowl of Junction and down the Junction Creek Valley and our approach. Lot of classic Rockies rubble. Approaching the crux section of the ridge to Junction Mountain - clearly visible at right of center here. The crux is sort of hidden in front of Junction. A good view towards the crux section. We followed a faint sheep trail around the east side of the high point here and around to the north ridge on the other side of it. Looking back at terrain we just downclimbed around the crux. It looks like we're home free but we're not. There's some tricky scrambling remaining. We always managed to find ledges leading down the east side of the ridge and around any serious sections. Looking back along the ridge to a very distant Pyriform now at far center right. More interesting downclimbing along some pretty severe exposure. Ascending this terrain would be easier than descending it but routefinding could be trickier. Impressive views along the crux at left and down the west alpine exit valley at right. At the col, off the tough stuff and looking back at the crux of the ridge towards Pyriform. There is a route up there but it doesn't look that easy. 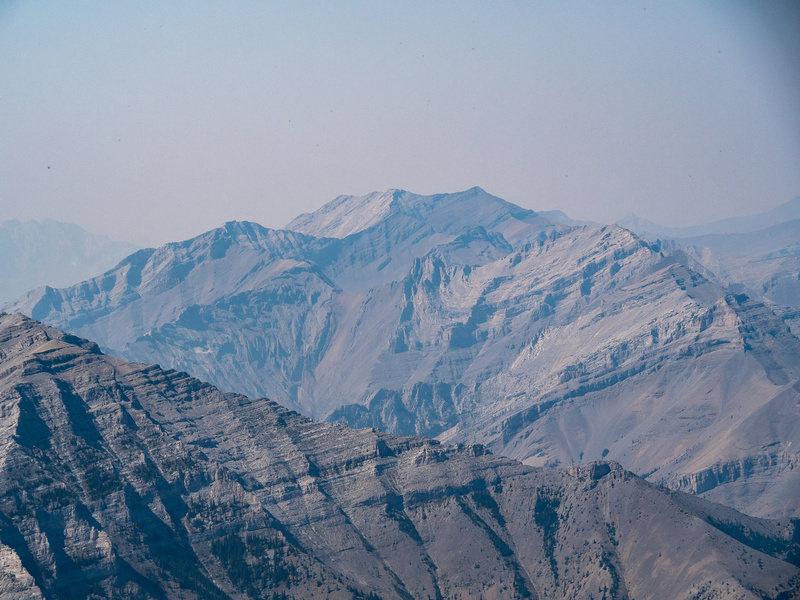 Around 300 vertical meters to the summit of Junction Mountain - but it's pretty darn easy. 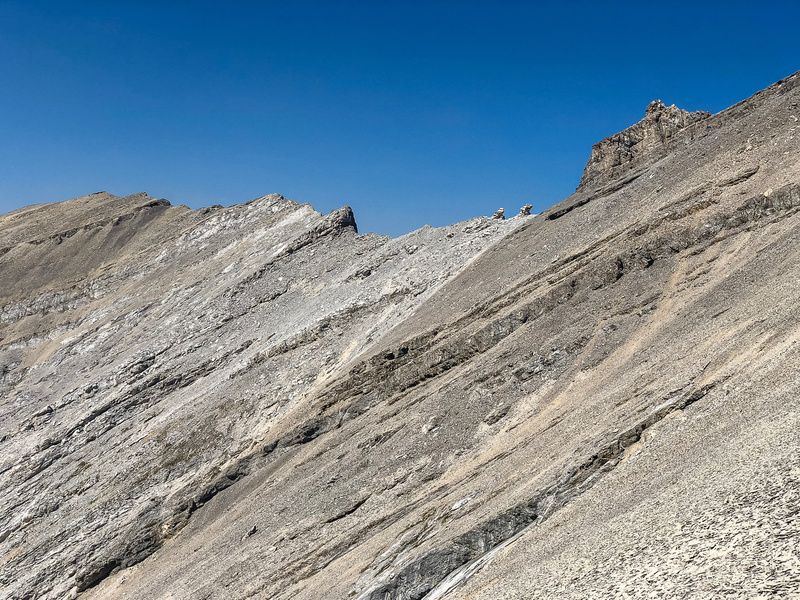 Looking back at the interesting ridge traverse from Pyriform. If doing it the "normal" way from this direction, the crux is encountered right away and is upclimbed instead of downclimbed like we did. Nugara has a route up this north ridge to the summit of Junction which can then be continued towards Pyriform. Great views south along the ridge to Pyriform with Patterson's and Head in the distance beyond at left. Trap Creek at left and our descent drainage to Junction Creek at right with the ridge to Pyriform at center. 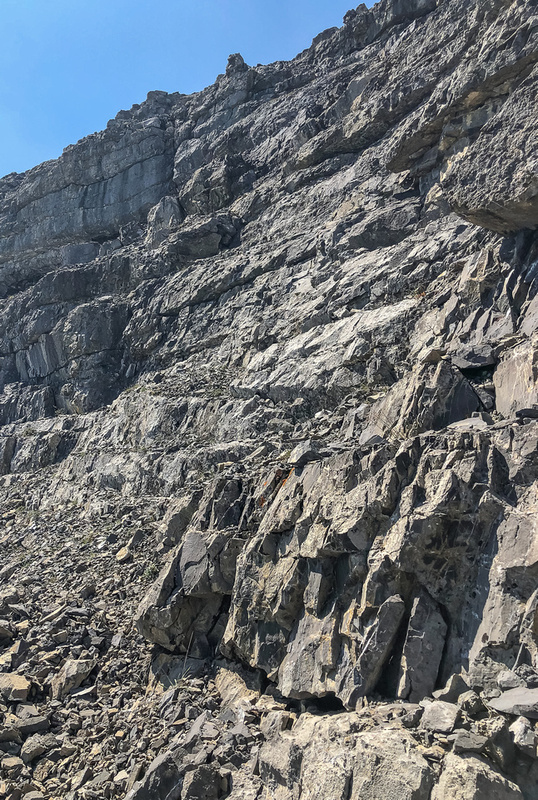 There is a route up the slabs at center rising right. Exiting the scree and heading down the west alpine valley towards Junction Creek. 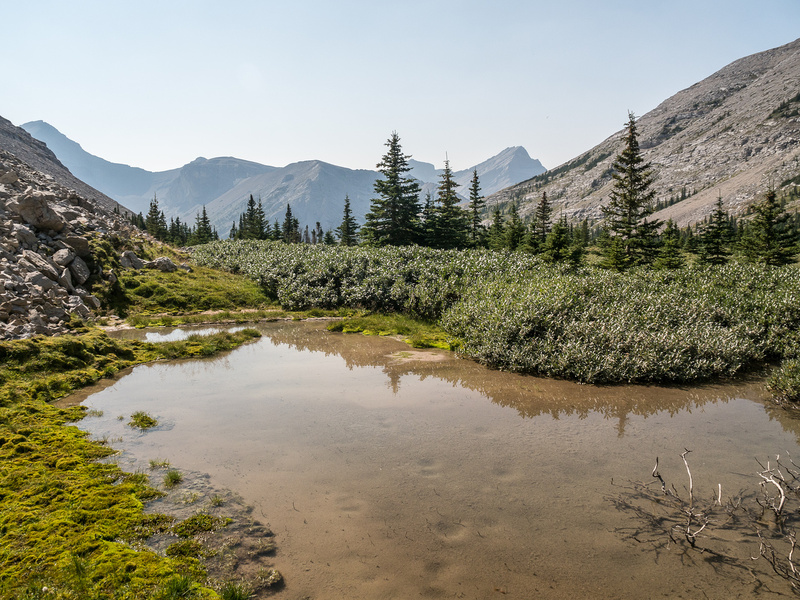 This "muddy" water hole is actually spring-fed and was so cold it gave us brain freeze. So good. Looking back at Junction Mountain from the watering hole. The summit left of center. We came down scree slopes on the right, avoiding slabs. Cold water never tasted so darn sweet before. Looking back to the summit as we exit the lovely alpine meadow. Lots of grizzly diggings here! Dare I say that fall is in the colors already? It's mostly heat / drought stress but it's fall colors! Bushwhacking in 30 degress to find our trail back. Not as much fun as it sounds. Back at the lovely deep pool where we took a long break and soaked our feet in the cold water. A gorgeous afternoon as we near the first campsite. 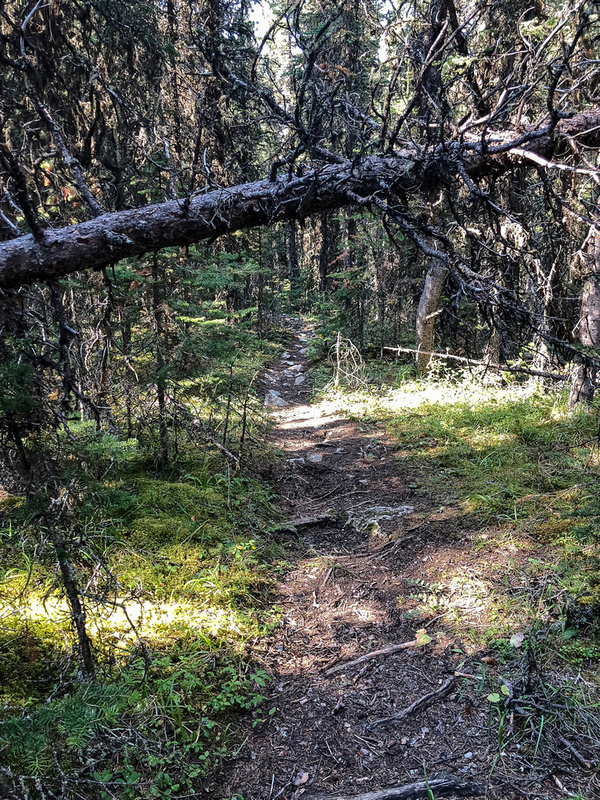 The long, pleasant Junction Creek Trail. Early evening lighting as I look back up Junction Creek on exit. 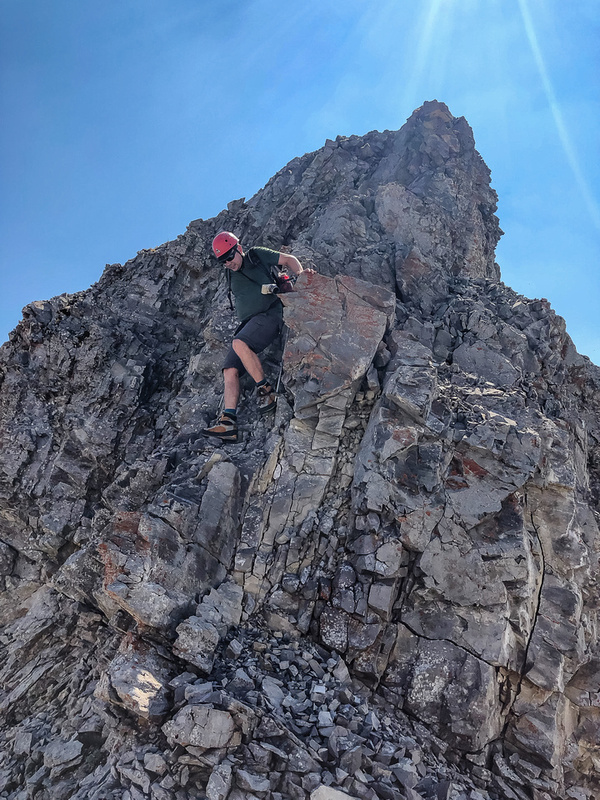 Overall I have to rate the Pyriform / Junction link up as one of my favorite scrambling trips in 2018 so far. 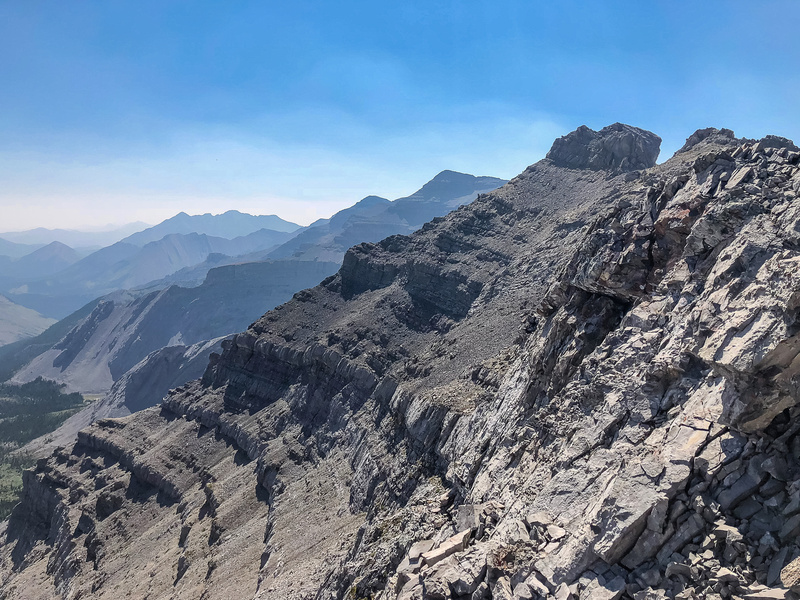 This trip had everything I love including a long approach, remote and beautiful valleys, good views and interesting scrambling along the ridge – and of course more than one summit! 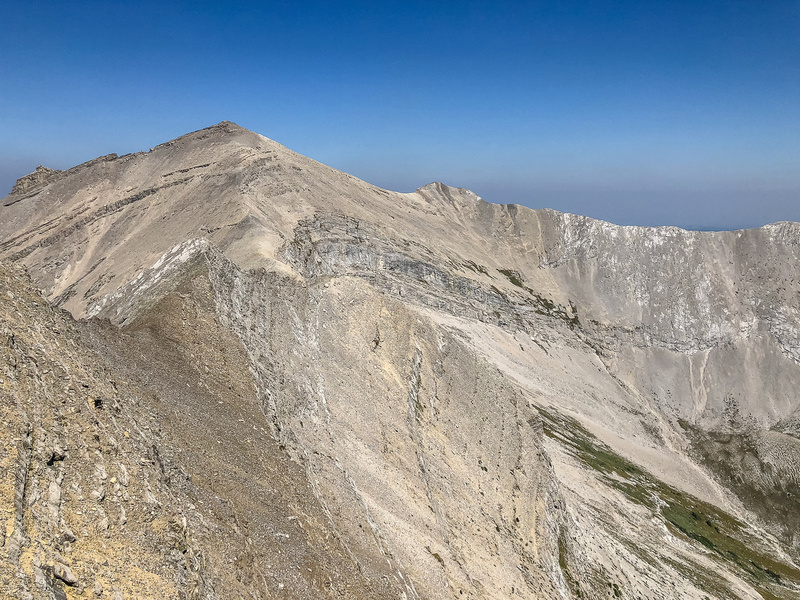 I highly recommend taking advantage of the connecting ridge and long approach and combining Junction and Pyriform Mountains into one longish day if you’re comfortable on difficult, loose terrain. 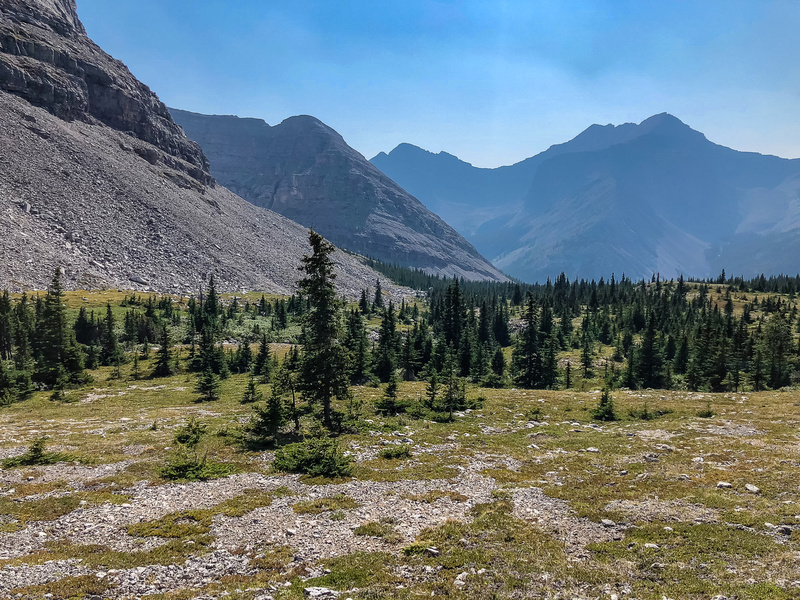 Another great option is to camp at one of several unofficial sites along Junction Creek and make this a multi-day adventure where you access the two peaks separately via easy scramble routes from the west.